Constant turning of the meat while rotisserie cooking allows it to self-baste with natural juices resulting in an exceptionally moist and tender bird. Lay turkey breast side down. Bring neck skin up over neck cavity. Turn under edges of skin; skewer to back skin. Loop twine around skewer and tie. Turn breast side up. Tie or skewer wings to body. Put a spit fork on rod. Insert rod in neck skin parallel to backbone; bring it ut just above tail. Put a second fork on rod. Insert forks in breast and tail area. Test for balance. Tighten screws. Tie tail to rod with twine. Cross legs; tie to tail. Most rotisseries have a counter balance, ensuring consistent rotation for best results. Test for balance by loosening the rod handle to allow the balancer to turn freely. Set the rotisserie rod in the slots of the barbecue casting. Let the heaviest side of the meat rotate to the bottom. Adjust the balancer to the top of the rod, opposite the heaviest side of the meat. Tighten the rod handle. Periodically, check to see if the meat turns smoothly while cooking. Adjust the balancer as necessary. There are two ways to cook a turkey on a rotisseries. Your barbecue may be equipped with a rear rotisserie burner or you may use the lower burners. We have outlined the grill set-up for both kinds of rotisserie cooking below. .
Centre a drip pan on vaporizer and position it beneath the centre of the food. Using the Rotisserie with the Main Burners. 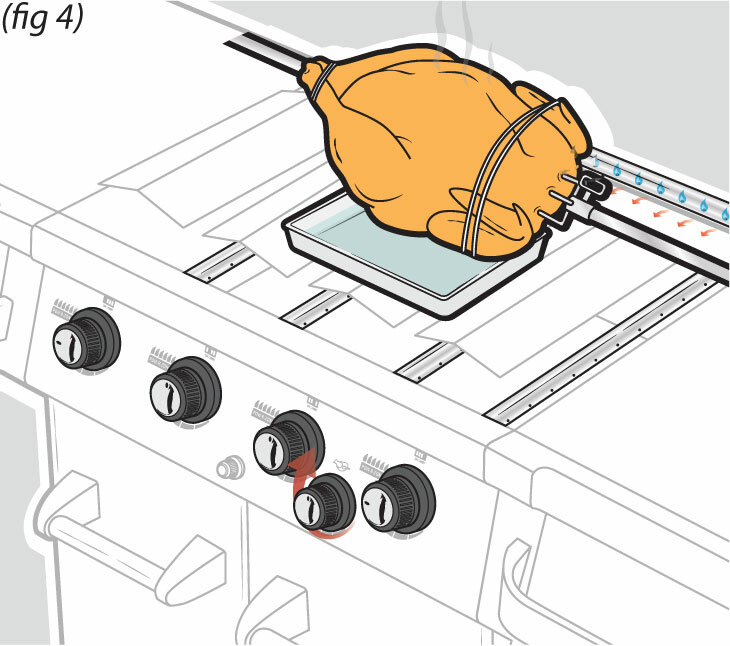 Place spit rod with carefully positioned meat into the rotisserie motor, and turn on and close the lid. Periodically check to make sure the meat is turning smoothly and adjust the balancer as necessary Also be sure to monitor the level of liquid in the drip pan, adding more liquid as required. Never let the drip pan dry out.